In another 12 hours or so, you will walk out - rains permitting - to toss the coin with the Peter Pan of Pakistani cricket. And the burden on your shoulders will be the most that any sportsman has ever carried anywhere in the world, any time in history. Tomorrow at this time of the night, I don't know what our frame of mind will be. Whatever it is - crushing sorrow or orgasmic elation - we won't be able to type out a coherent sentence for sure! You know what the silliest slogan for this Cup is? 'Win it for Sachin'. Here is a man who had given 22 years of his life to make us deliriously happy and all we can think for him is charity? As if he can't win it for himself. And to make it worse, the media have gone berserk over his forthcoming 100th hundred. As if there isn't enough pressure on him already. But don't worry. He can take the pressure. You know, don't win it for Sachin. Win it for yourselves. Or worse, let him retire from international cricket with 99 hundreds. And no World Cup against his name. Sometimes, a blemish makes it look better. You see 99.94 and know what I mean. But while we are in our senses - and till we come back to it again - we love you guys. Just love you. How can you not love Viru - who's started every single match with a four. And Yuvi, who's outdone even his own mentor as far as redemptions go. Zak, who seems to be getting better with every match. Ashwin, who's come into his first World Cup with nerves of steel. And all the other guys. Some of them may have floundered a bit recently but have given us those moments of glory that we will remember for the last days of our lives. Who knows which one of them will do that again tomorrow? And we will love you guys even more for that! You know the last time India played a World Cup semi-final at home? It was in the city of this blog - a place known for cultured connoisseurship. And you know what we did? We stoned the players out of the ground when it was clear that India was about to lose the match. We claimed to be experts of the game and we didn't realise that it was harakiri to bat second on that pitch. We cheered like banshees when Jayasuriya and Kaluwitharna got out in the first over of the day. We cheered like monkeys when Sachin was playing like a maestro on that minefield of a pitch. And then, we pelted the future World Champions of cricket with plastic bottles. You see, for all our professed knowledge about the game, we know NOTHING! So ignore us when we hassle you for picking Chawla. You did the right thing by choosing Nehra for the last over. Well almost the right thing, because the only guy who could have won us that last over was probably Sachin. We are saying all this because of two reasons. 1. If you lose tomorrow, there will be a complete breakdown of logical faculties and we will want to kill you for that. We won't really kill you but may try/want/need to. 2. You know why you have to listen to nonsensical jerks like Srikkanth? Because, he was part of the last team that got us the Cup. And if that isn't enough to get your form back, I don't know what will. So, errr... change the game. Incoherent mail? You bet! Was meant to be a short note to lift some pressure off your shoulders. Oh - and one last favour. Kill the bastards. As we enter the last leg of the league matches of the World Cup, a quick update on the World Cup book may be in order! Excuse the subtle (but pompous) emphasis on the. 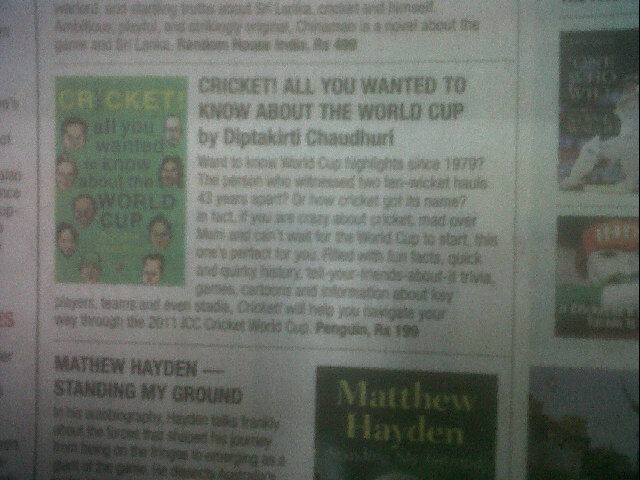 To start with, The Times of India listed the book in the World Cup special of their What's Hot supplement - as one of the few books to buy during the tournament. 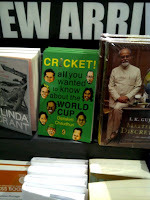 It had some totally cool books for company including Mathew Hayden's autobiography and Shehan Karunatilaka's Chinaman (which is being touted as the - again, emphasis - Sri Lankan novel). Most people complimented me on the positive 'review' before they discovered it was the blurb! My colleagues at work realised my predicament and soon, the book made an appearance on HT City as well. 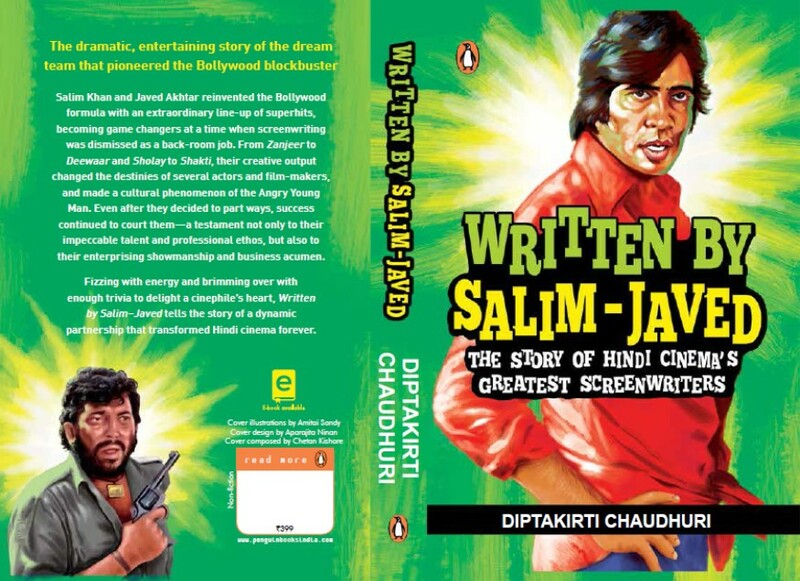 The first serious review of the book appeared on Suhel Banerjee's blog. The adult in him was disappointed but the child was suitably happy at "the well researched statistics, the junkets of trivia gleaned from over 35 years of the WC, the jovial sketches of players, coaches and commentators, the most spectacular matches which the present school going generation couldn't watch live, highlighted and described with the love and passion for the game - all this put together makes it a must gift have for most school going kids"
Another 'social media friend' - Abhishek Mukherjee - was among the early adopters and wrote me a very complimentary email (which also pointed out some errors). Since the note was personal and the errors were embarrassing, I will not reproduce them here (heh heh - smart, no?). But I will do post a very cool picture of two books he received from Flipkart on the same day. And I was mighty pleased to hear that he read the one on the left first. So what if it was because of the looming World Cup? My batchmate - Karishma a.k.a Kim - decided to give me a signpost on our alumni website, where I got featured alongside the HR Head of P&G (a senior of mine) and a batchmate who is a prospective Mills & Boon writer! I was quite amused find myself in the company of two beautiful women for having written about 11 not-so-beautiful men! Kim also took this picture at Landmark Delhi and put me in the august company of a former Prime Minister. After this, two media behemoths of East and South decided to post very positive reviews of the book in their book/young sections. The Telegraph - on March 4 - listed Cricket! in its Paperback Pickings. 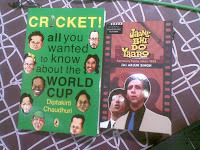 The review started with "need of the hour" and ended with "...neatly compiled and accompanied with caricatures, this book provides facts that are indispensable to a cricket-lover’s arsenal". Needless to say, this review gave a fitting reply to all those in my hometown who thought that my crowning glory was getting a three-digit rank in the West Bengal JEE. When last heard, my mother was preserving the day's paper and my father's childhood friend was hunting for the book high and low! 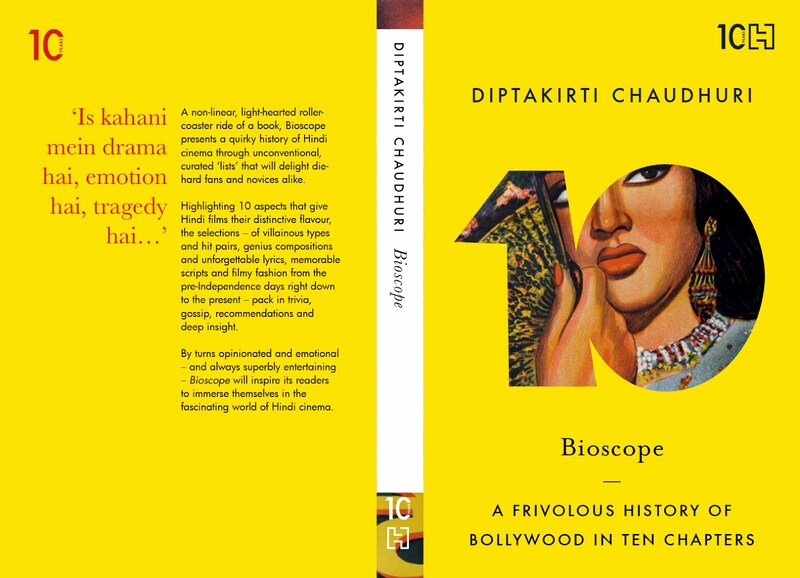 The Hindu sprung the other pleasant surprise when the book got listed in its Young World supplement. The venerable Murali N. Krishnaswamy's reviews contain phrases like "thoughtful touches", "sprinkled with history and facts" and "well-rounded book". It also says that the book has "a series of delightful illustrations done by the author himself". 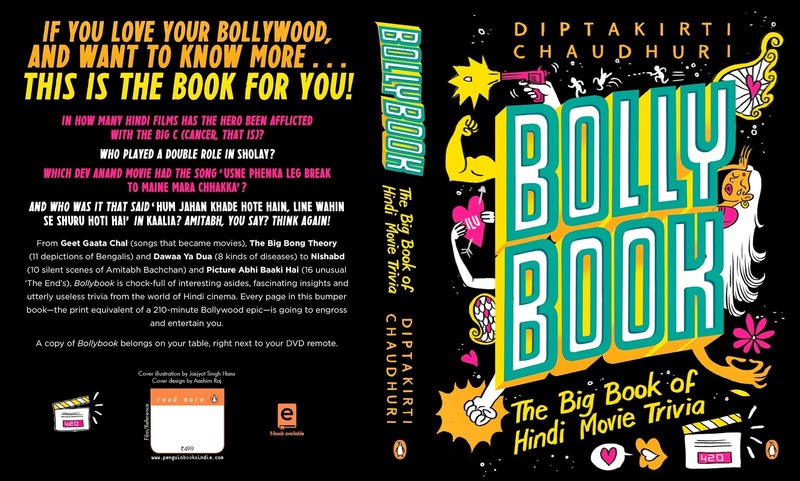 While I totally agree with the delightful illustrations bit, let me quickly point out that they are done by Dipankar Bhattacharya. I can't draw to save my life. Nevertheless, ignoring The Hindu is not something even Ms Jayalalitha or Mr Karunanidhi does very often - making the recommendation very clear! UPDATED TO ADD: Shri Time Out Delhi has come out with a nice review too. They feel "the author has kept the content simple and breezy for his book’s younger audience" and "with its wide field of anecdotes, trivia and statistics, it’s a pretty good read for adults too". They get the publisher's name wrong but hey, nobody's perfect! Oh - they also mentioned the author's "well-known and witty blog". Thank you, thank you - you are too kind! All in all, I have all the material for the second edition's blurb stitched up. Only, I need the first edition completely cleaned up before that can happen. I have been told by the super-efficient folks of Dial-A-Book that they have a few 'author-signed' copies (ahem) left. I am sure they can even get you a non-signed copy, should you want. The online bookstores (listed helpfully, on the right column) are your fallback choices - if you are anywhere in India. Or, you could walk into one of the real bookshops near you. What? Still reading this post? 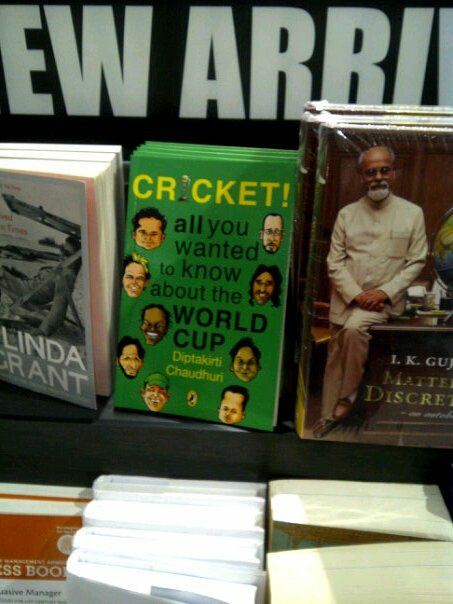 Where's your copy of Cricket - AYWTKATWC? The second child has lots of déjà vu around it. The same doctor, same nursing home and even the same labour delivery room only heighten the feeling. You are a little more relaxed about the process but as – if not more – anxious about the outcome! And a planned delivery date (to induce labour) makes it a wee bit orderly, maybe? So, my brother-in-law, his wife and I allowed ourselves a few jokes with the attending doctor. Doc: Any complications during last delivery? Me: None during the delivery. But the boy’s growing up is a different matter altogether. Doc: I will be there for the delivery. 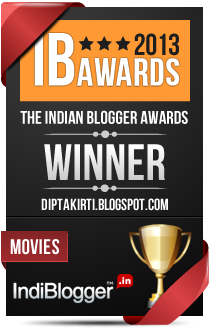 My sis-in-law: Can we get Aamir Khan to do the delivery? The nickname (daak naam) was trickier. I thought it was settled when we named the son Joy. Like all Luvs have brothers named Kush, all Joys are destined to have siblings named Viru. Being a god-fearing Indian, I thought that is what the epics ordained. Except my son – a Cartoon Network devotee – had other ideas. (Cartoon Network is to Sholay what Scientology is to Christianity.) In line with his favourite show’s names, he has named his sister Ferb. Yes, yes – don’t ask! And since I remember an idiot called Roon who named his younger sister Moon (and no one objected), I stood around while this happened. Ladies and gentlemen – meet Ferbie Chaudhuri. Like most embarrassing Bengali nicknames, we are hoping this will sound less sillier with time. A girl child born on International Women’s Day is expected to grow up to become one hell of a woman. But then, why should women be special only on one day of the year? Having as much faith in sun-sign based astrology as Dhoni has in Sreesanth, I am always wondering what a child will turn out to be. So, I always look for people born on the same day and want to believe that the child will turn out like that. Five years back, Roger Waters being born on September 6 was reason for great joy. This time, we had a very bubbly young colleague who was born on the next day and the girl’s mother the day after. I was quite satisfied with that since Fardeen Khan is clearly not in the same league. But I am happy now that there are no ‘famous’ predecessors on the same day. 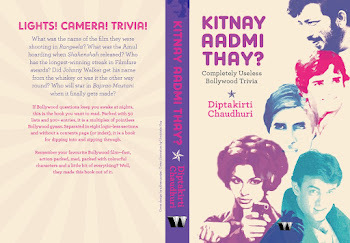 I just hope that a few decades on, some other father would search for famous birthdays on 8 March and feel very happy that Drishti Chaudhuri was born on the same day.